The Glasgow Film Festival has asked Noir! 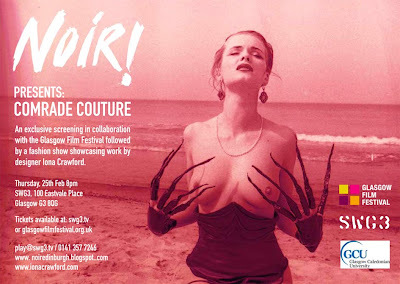 to organise a fashion show to follow the screening of 'Comrade Couture', a celebrated new documentary about the fashion scene behind the Berlin wall in the old days of the GDR. The event will take place at SWG3, a fantastic warehouse space in Glasgow which is home to a constant buzz of cutting edge creativity. We will be using the occasion to celebrate the strongest new Scottish talent with the spirit of rebellion typified in the film by staging a strong performance piece showcasing a selection of fashion designer Iona Crawford's strongest pieces. Already much heralded, Iona Crawford is definitely one to watch and is heading for a stellar career. We are delighted to welcome Sabine Von Oettingen as a special guest on the night. Van Oettingen is a fashion designer and star of the film and is one of the central characters responsible for the exciting revolution in fashion & hedonism featured in Comrade Couture. Noir! is an artists collective who have been putting parties on in Scotland over the past year. We showcase new art, fashion, film & music at each event and have quickly become known as one of the go-to events on the calendar. Tickets at £7 available through SWG3 ( http://www.swg3.tv/) or through the Glasgow Film Festival (http://www.glasgowfilmfestival.org.uk/).